7 local establishments and hundreds of individuals coming together to raise awareness and funding for a great cause! 100% of all funds raised will go directly to the Alisa's Wish Child & Youth Advocacy Center. No wages are being earned in any part of this community effort. All supplies and resources are being generously donated by people who care. This effort will run all month long through June 2017 so there are many ways to get involved! Visit our schedule of events below to get more information local businesses hosting some fun and interactive fundraisers offering yoga, martial arts, and other wellness services. We are also accepting individual or corporate donations of any amount to help add to our total if you'd like to take part but can't make any of the events we are offering. Alisa’s Wish Child & Youth Advocacy Centre, a program of Maple Ridge/Pitt Meadows Community Services, provides children, youth and their supporting families in Maple Ridge, Pitt Meadows and Katzie First Nation, with the help they need when words are first spoken or behaviors first noticed that indicate a child may be the victim or witness to physical, emotional or sexual abuse. Since 2013 Alisa’s Wish has provided a comfortable, safe and child friendly space where a child or youth can share their story of abuse and trauma. They bring the coordinated services of a multidisciplinary team to our kids in order to reduce the barriers to victim support and counselling and start them on their path to healing as soon as possible. In over 3 ½ years of operation they have seen over 250 children and youth at the Centre, impacting well over 750 family members; boys and girls ranging from 2 yrs old to 18 years old. The families in their care leave the Centre feeling supported by their Child and Youth Advocate and leave with services at their fingers tips. Victimized children tell their story without being further traumatized. Since the entire center works as part of a multidisciplinary team they are able to provide more effective supportive services for children and youth in our community. Did you know there are only 3 municipalities in Lower Mainland that have centers like Alisa's Wish? If you live in one of these few fortunate muncipalities and your child was ever victimized they would be exposed to a far less traumatic process of legal and physical examinations then anywhere else in BC thanks to centers like Alisa's Wish. If you don't live in these areas, do you know what the process is for the kids in your community? I'm very sorry to say that it would be a much more traumatizing experience! The most important element in the long term success of programs and centers like Alisa's Wish is education and awareness. Please share this information with everyone you know! Decompress the discs of the spine, release tension from the back, neck and shoulder muscles, increase spinal mobility, and decrease connective tissue restrictions, all through the use of the amazing assortment of therapy balls. This workshop will lead you into therapeutic bliss and give you the tools you need to self-massage any time you need it! This therapeutic yoga class will be taken to a whole new level with the addition of a guided meditation practice. Together, Rachel and Patty will take you on a gentle journey where mind, body, and spirit unite in a place of relaxation and deep healing. This class is accessible for all levels, and safe for most injuries and health conditions. There is a reason why both meditation and yoga are the most highly recommend treatments for stress related conditions! Join us for this charity event and discover these benefits first hand! 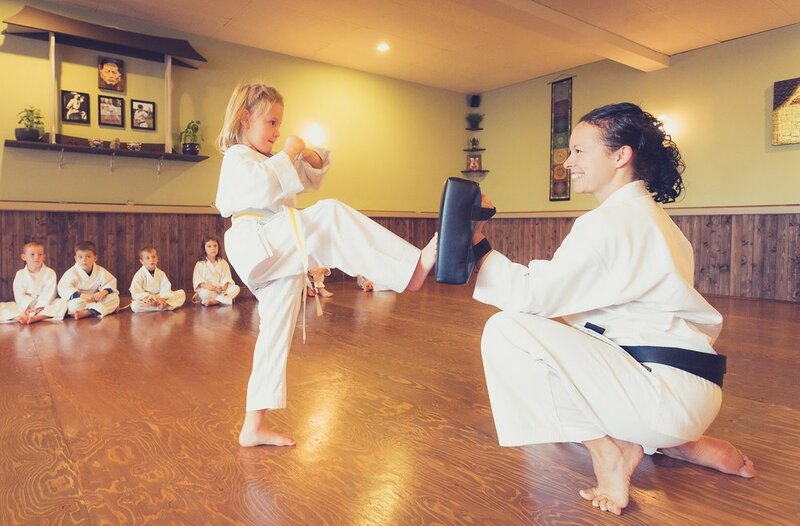 Kicks For Kids - A Karate Kick-A-Thon! A fun event where students will be gathering pledges based on how many front kicks they can throw in a 10 minute period. Pledges can be collected in the form of a lump sum donation, or a specified number of cents per kick completed in the 10 minute period. On event day, we will all get together with volunteer counters and kickers and have some fun! This year the event will be led by Erin Jacob, who is placing out a personal challenge to see if any other student can beat her number! If you would like to sponsor Erin, or any other student in this contest please contact us at: tracy@centeredwithinyoga.com.